So, let's talk story. There are a lot of spoilers I'd really love to talk about, but looking back at how I discussed new story content releases in the past (also wow, I forgot just how enamoured I was with KotFE's story at launch), I know I can manage a fair chunk of discussion without actually giving the game away, so I figured I should be able to do so again. Feelings can't always be explained, but I do like to analyse why things make me feel a certain way whenever possible. And funnily enough, one of the first things that Jedi Under Siege reminded me of was Makeb. The thing is, I've never even been particularly fond of Makeb. When it was released I thought that the story was decent fun, but it wasn't amazing. Being the game's first official expansion, it was judged by the standards of the launch game, and in those terms it fell woefully short. While we already knew that we weren't going to get any more class story content, Makeb still felt like a bit of a letdown being "just" a planetary storyline, even more so when Bioware made attempts to sell it to us as a continuation of our class story anyway. (Doesn't the loading screen summary still refer to it as "Chapter 4"?) It was pretty obvious that it had been written for a generic hero of any class, and beyond a couple of pieces of background companion chatter in certain areas, there were no real references to anything that related to your character's class or story. It was particularly jarring if you had your romanced companion along and they didn't even do as much as bat an eyelid or even lose any affection with you if you started making out with an NPC in front of them. In hindsight though, Makeb was also the last time that we had distinctly different storylines for Republic and Imperial characters. After that things merged gradually - Oricon still had a very different feel for both factions for example, but strictly speaking you were jumping through the exact same hoops on both sides. Shadow of Revan had somewhat random-seeming variations in dialogue and with cut scenes, but was ultimately still the same story regardless of your faction, until KotFE pretty much did away with the two factions altogether. The problem with companion interactions has always been a matter of effort vs. reward. Even with just the Vanilla companions, and quests being targeted at just one of the two factions, if a mission was open to all classes it meant that you would have had to account for a total of twenty-one different companions per faction reacting to it, which was just madness. The practical result was that you could bring whoever you wanted, but they did nothing. 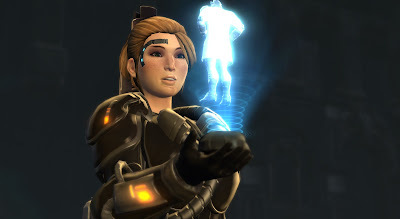 In KotFE Bioware changed the approach to instead requiring you to bring a specific companion to each mission, but this companion would then react to things and interact with you throughout the whole thing. Whatever else you want to say about KotFE, I found this change hugely preferrable, and I was happy to see it continue on Ossus. Companions aside, the challenge of making a storyline that feels personal and fits your class without actually having more class stories is something that Bioware has struggled with for years. Content like Makeb or Oricon felt alright to play through (fighting for the Republic or the Empire was what we did after all), but it always felt a bit impersonal at the same time, what with the lack of companion interactions and only minimal references to your class. It didn't feel like it mattered whether you were the Commander of Havoc Squad, the Barsen'thor or someone else, because it literally didn't. They took first steps towards making it personal again in Shadow of Revan, where you personally became important not because of your class, but because of your association with Lana and Theron and helping to uncover the Revanite conspiracy. Then the focus shifted to the Emperor, KotFE came out, and they went all out turning you into a kind of Chosen One who was the only one who could resist the Emperor. Now, while this was always problematic for non-Force users in particular, the enthusiastic early KotFE review I linked earlier shows that I didn't consider this a deal breaker initially. I liked the more focused and personal approach. The problem was that as time went on the story insisted on trying to tell us what our character's motivations were in great detail (You're going to do this because you now hold a grudge against Arcann! No, I don't?) and that it eventually elevated the Alliance Commander into a kind of "sole saviour of the galaxy" role that many people were profoundly uncomfortable with, considering that most of the class stories had been about you being important but still part of something much bigger. The great thing with the approach that Bioware has taken on Ossus is that your role as Alliance Commander is now pared down to something more similar to the old class roles - important enough to turn heads, but not more than that. As such, it can live alongside your old identity without overriding it, while still providing a story hook to provide some general direction. Ossus is still a personal story, as you get sent there because of your role as Alliance Commander, but the actual goings-on on the planet tie smoothly into your character's wider backstory, such as the Jedi in the enclave remembering your Jedi character, or Darth Malora recalling how your Sith treated her back on Korriban. The end result is a story that, in my opinion, manages to combine the best parts of KotFE (the feeling that the story is personal to you, that you're not just a generic hero, as well as the increased companion involvement) with all the things that we've really been missing since Vanilla SWTOR: Republic vs. Empire, references to our base class, being part of something greater. The only way Bioware could top themselves at this point would be by bringing full-fledged class stories back, which of course won't happen... but if the next story update/expansion is written in a similar way to Ossus, we have good reasons to get excited again anyway. Hmm... I'd never say never on the class stories, but I also think that it's something that the SWTOR dev team would need more bodies to develop. I, for one, really liked Makeb. When I did it at level on the Imp side, that end boss really gave me fits for an Inquisitor. I even ended up respeccing as an Assassin just for the damage mitigation that the Assassins get on their tank spec just to finally bring the end boss down. To hear that Jedi Under Siege is akin to Makeb with the disparate faction stories makes me happy. I'll be fine. Since I'm not on Twitter, that shuts off one major spoiler angle, and I've not been able to listen to any podcasts recently, so I'm fine there too. I'm hoping to play through this later today. 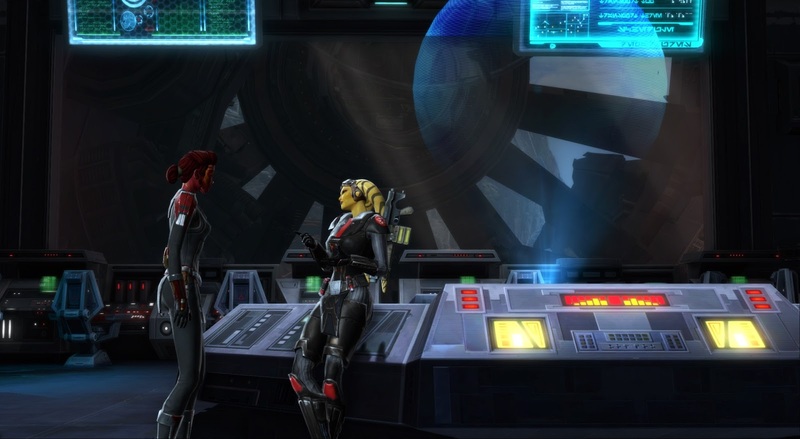 It'll be good to be back in SWTOR for some new story. I too found being the "solo saviour" plot of KOTFE uncomfortable, equally I think it gets boring eventually. Bioware had a bit of a problem with over-inflating the stakes of our character's actions. Did Empire side already and it was awesome. Best companion in forever!